Taking just a moment today to mourn the death of cinema icon Elizabeth Taylor, who died this morning of congestive heart failure. She was 79. In a career that spanned more the 70 years and with over 50 film credits to her name, Ms. Taylor was the epitome of Hollywood beauty and glamour. She won two Academy Awards for her performance as the call-girl Gloria Wandrous in Butterfield 8 (1960), and as the scornful wife Martha in Who's Afraid of Virginia Woolf? (1966). Hollywood Remakes Jerry Lewis. Again. Anyone who read my piece on Jerry Lewis in Scarlett Cinema last year knows how much I adored his films as a child (I still do). So when I heard that he was allowing the studios to remake these wonderfully absurd films-- particularly The Bellboy-- I was more than a little anxious that film executives, hard-pressed to produce sure-fire hits, would not be able to do the films justice. In fact, as of this writing, I am almost certain that they won't. Lewis' films are indelibly marked and characterized by the comedian's own specific brand of physical comedy, which is completely original and wholly embodied by the star's unique on-screen presence. So it comes as no surprise that studios like Paramount and Universal, who have yet to win the bid for these films, are hoping to capitalize upon Lewis' legacy and cash in, just as Universal did with its remake of The Nutty Professor (and sequels) in the late 1990s. Lewis' candidness in interviews about being aware of the studios' reliance upon tried and true material speaks to one of the greater issues plaguing Hollywood right now; and that is an overarching terror of anything considered to be risky or original. Though Inception proved last year that audiences were willing to pay the full price of a movie ticket to see a big Hollywood film based on a totally original concept, executives at major studios still seem to view this as the exception rather than the rule. Case in point: seven out of the top ten highest grossing films at the box office last year (Toy Story 3; Alice In Wonderland; Harry Potter and the Deathly Hallows Part 1; Shrek Forever After; The Twighlight Saga: Eclipse; Iron Man 2; Clash of the Titans) were either a remake or a sequel, demonstrating that most studio heads simply aren't willing to invest hundreds of millions of dollars in vehicles that don't already have a built-in franchise or name brand recognition. At least, not while the economy is still weak, ticket sales are barely holding steady, and revenue from DVD sales are in sharp decline. And so the machine chugs onward, cannibalizing great films of the past while the majority of unique voices in the industry are relegated to the margins of indie-film purgatory. To my mind, perhaps the most galling thing of all is the sheer irony of the Lewis remake deal: when Lewis was allowed to make his directorial debut with The Bellboy in 1960, he essentially staked his claim as a maverick among filmmakers at the time. He initially began producing his own films so as not to be hindered by studio mandates. Restricted by budget and scheduling constraints, Lewis shot The Bellboy entirely in one location and without a script. He was also the first director in Hollywood to make use of video assist, which has since become an industry standard. 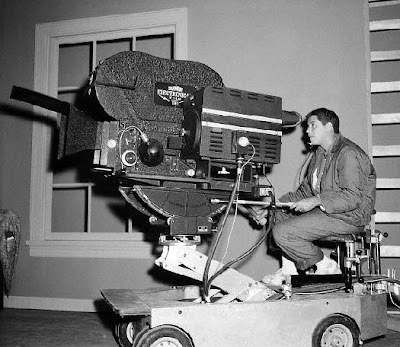 In short, Jerry Lewis established himself as a filmmaker who was not only afraid to try new things, he could not tolerate making films in any other way but his own. The result was a legacy towards which Hollywood is now scampering because most studio executives are currently too risk averse to make the kind of bold choices that once guided Jerry Lewis' own career. *Note: Despite my cynicism towards the remakes of The Bellboy, Cinderfella, and The Family Jewels, fans of Lewis' work can at least be consoled by the fact that Lewis himself will be critically involved in every step of these films' development. So, there's that. Here's hoping.